William A. Wheeler III’s interest in history began in childhood, browsing at the American Antiquarian Society in Worcester, Massachusetts. In adolescence Wheeler contracted polio, sparking an admiration for Franklin Delano Roosevelt and other historical heroes whose lives were touched by the condition. As he became a world-renowned expert in the optimization of manufacturing processes, he applied his problem-solving skills to his interest in the fields of both Revolutionary and Presidential Americana. 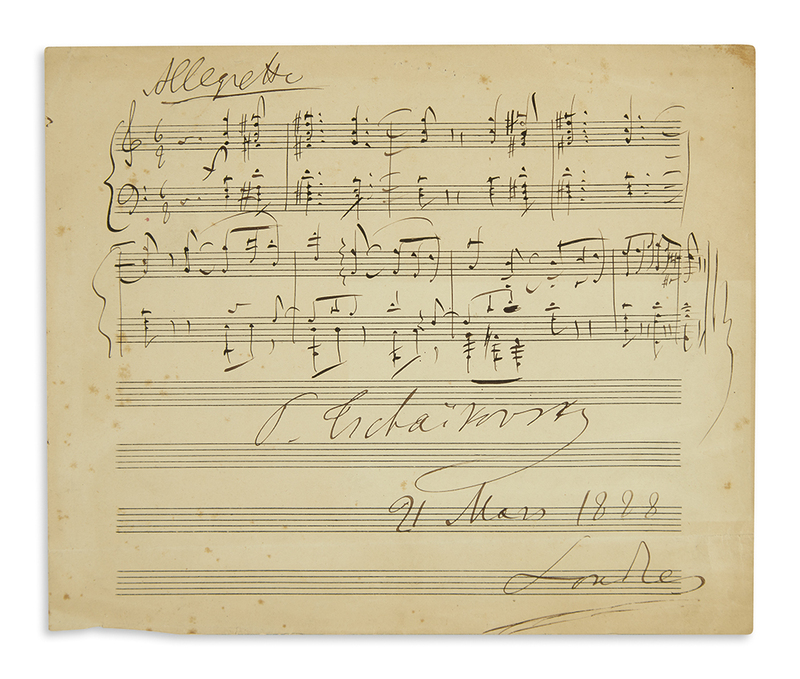 This collection offers glimpses of American history both manuscript and printed, with a wide breadth of presidential and revolutionary Americana, including letters signed by George Washington and Thomas Paine; and documents signed by Benjamin Franklin and Paul Revere. Printed items include a broadside from Massachusetts in May of 1776, declaring the justice of the rebellion. 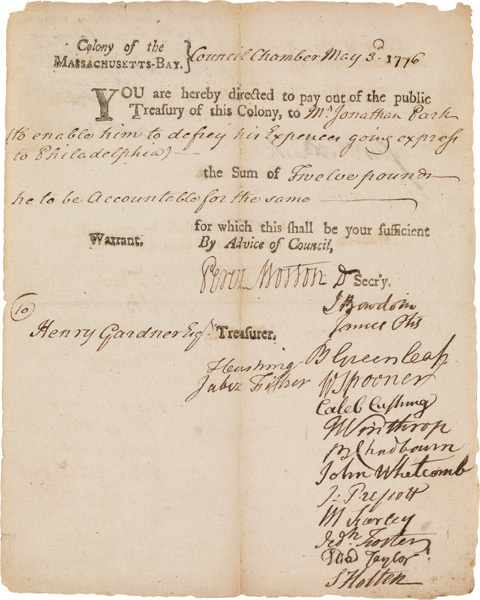 Lot 75: Pay order for £12 to express rider Jonathan Park “to enable him to defrey his Expences going express to Philadelphia” to warn the Continental Congress of the imminent arrival of British warships, Massachusetts, 3 May 1776. Estimate $20,000 to $30,000. Lot 55: Paul Revere, Autograph Document Signed, Boston, 1779. Estimate $12,000 to $18,000. 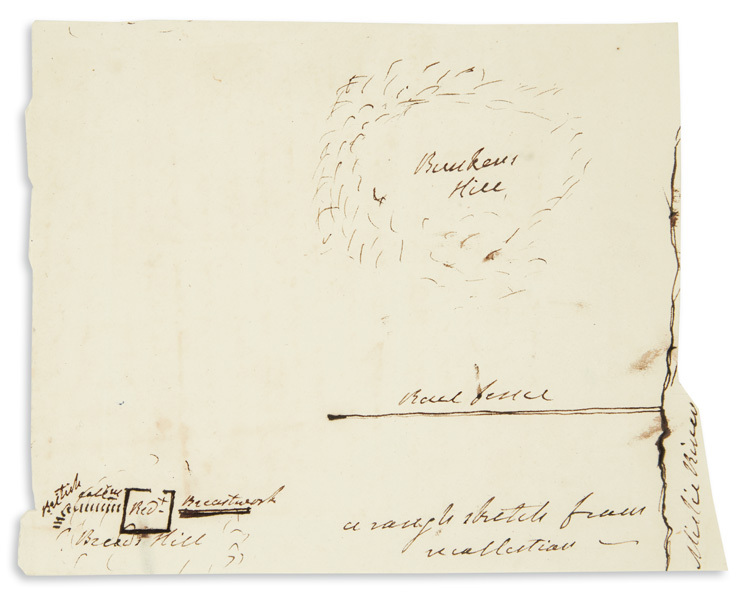 Lot 16: Henry Dearborn, two Autograph Manuscript items including a drawing of Bunker’s Hill, unsigned, 1818. Estimate $6,000 to $9,000. 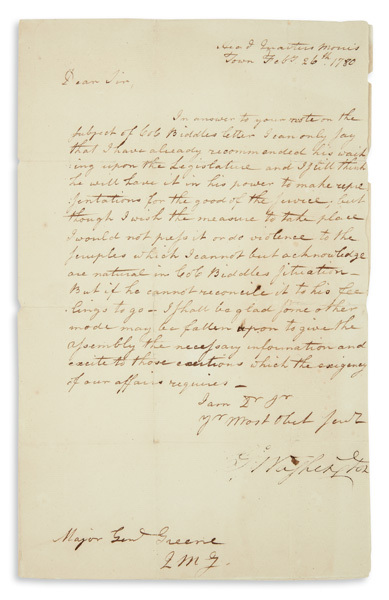 Lot 72: George Washington, Letter Signed to Major Nathanael Greene about Colonel Clement Biddle, Morristown, 1780. Estimate $15,000 to $25,000. 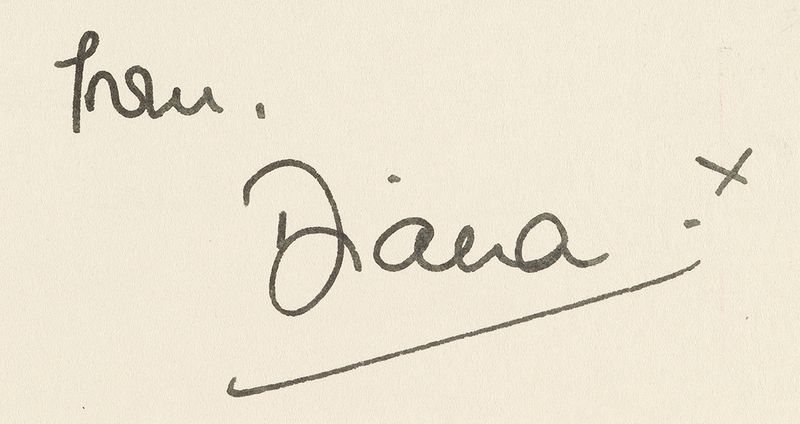 Featured is an impressive run of important letters, including autograph letters signed by Patrick Henry, Thomas Jefferson, Thomas Paine, Joseph Warren and Benjamin Rush; and a letter signed by Alexander Hamilton, organizing part of the provisional army during the Quasi-War with France in 1799. 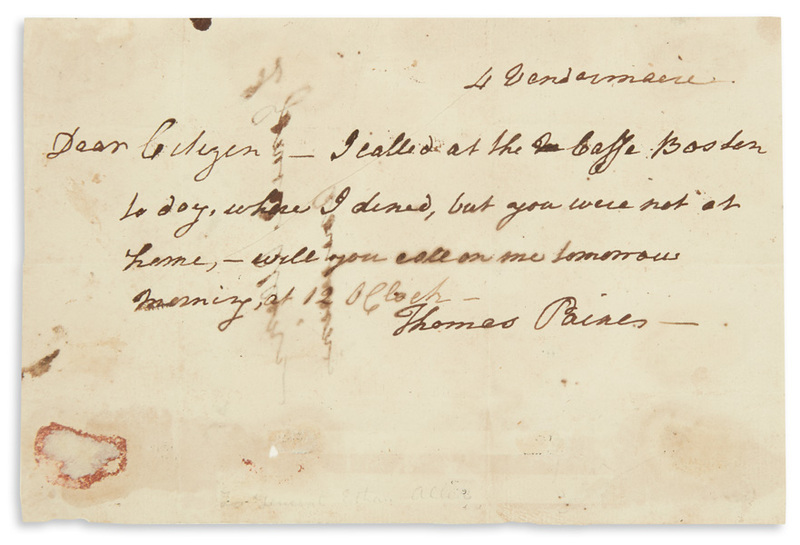 Lot 44: Thomas Paine, Autograph Letter Signed to Ira Allen concerning the Boston Café, Paris, 1790s. Estimate $10,000 to $15,000. Wheeler, notably interested in Andrew Jackson, collected with a view toward creating a narrative of the politician’s career. Items relating to Jackson include an autograph letter signed in 1819 on the legitimacy of the Seminole Wars, and another from 1806, giving his account of the duel in which he shot and killed his opponent. 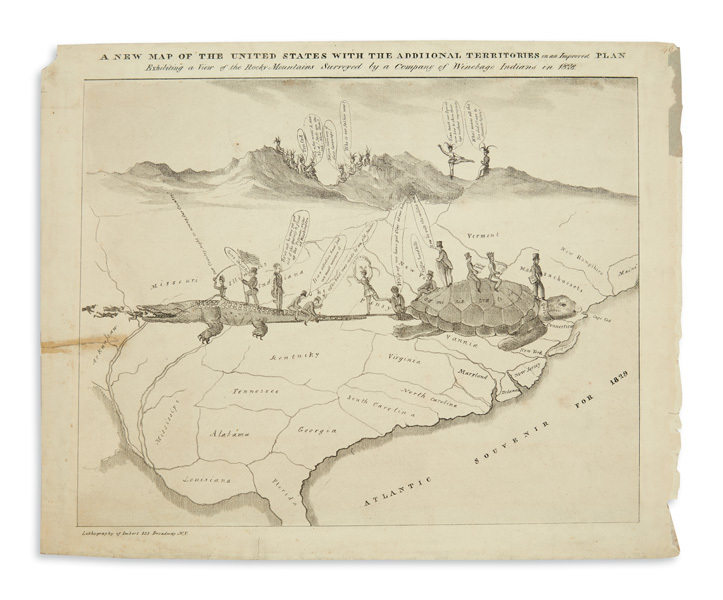 Andrew Jackson, A New Map of the United States, lithograph, circa 1828. Estimate $3,000 to $4,000. Our specialists accept consignments on a rolling basis. For a complete list of consignment deadlines and upcoming auctions, check our Schedule.